Bickel has adopted a new character building program this year, inspired by the “Sixteen Habits of Mind” which was developed by educators Costa and Kallick. Throughout the 2017-2018 school year, we will be focusing on four of the sixteen habits: persistence, managing impulsivity, thinking flexibly, and listening with empathy and understanding. We’re so excited to learn about and practice these habits together as a whole school! Teachers have been given a book on the habits of mind, and each quarter they read the chapter that corresponds with the latest habit. Then they take this knowledge into the classroom and create learning opportunities for their students. Classrooms spend time watching videos, reading stories, doing hands-on activities, and creating conversations all centered around these habits. Additionally, each grade level classroom has been partnered with another “sister class” with whom they can complete character building activities (5th/2nd, 4th/1st, 3rd/kindergarten). With this, we work to create a tight-knit community of students in which age isn’t a barrier and leadership is simply a way of life. Lastly, a committee of teachers has volunteered their time to lead Monday morning assemblies focusing on each habit. Here student successes are recognized, skits are performed, and words of encouragement are offered. First quarter’s habit was persistence. Persistence is sticking to it! 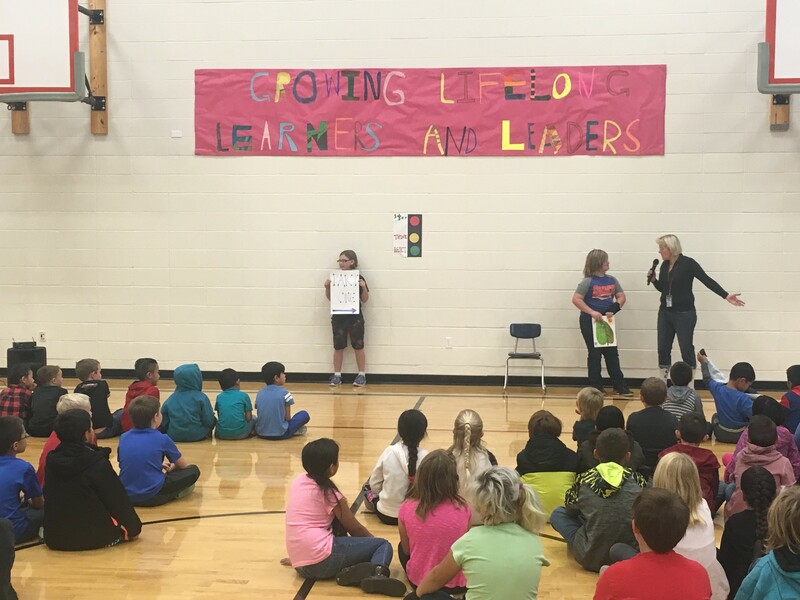 During our weekly kick-off assemblies, we heard countless students share how they demonstrated persistence that week. Many were refusing to give up on hard math problems, working hard to beat their new reading goal, and even conquering fears on the playground. It has been so inspiring watching teachers and students, alike, see the results of never giving up. Keep checking in on this page to see updates as we learn our new habits of mind. Ms. Idso teaching the students about managing impulsive behavior at one of our weekly assemblies. 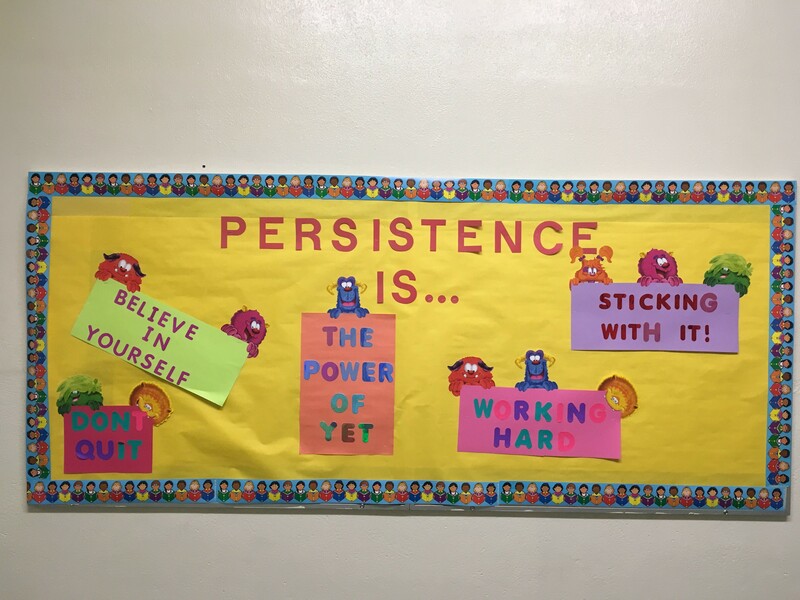 First Quarter’s habit highlighted on a bulletin board. 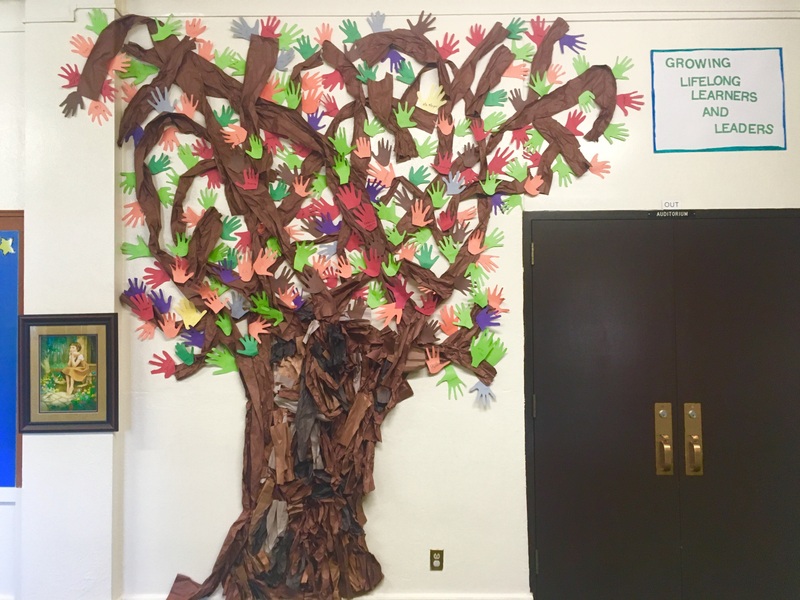 Each Bickel student traced their hand to create our tree.